Except for some minor table settings, all the data is input in the first and third tables, Set-up and Rent Roll. The remaining tables populate automatically (excluding the Stabilization Calculations table, which requires several user inputs). 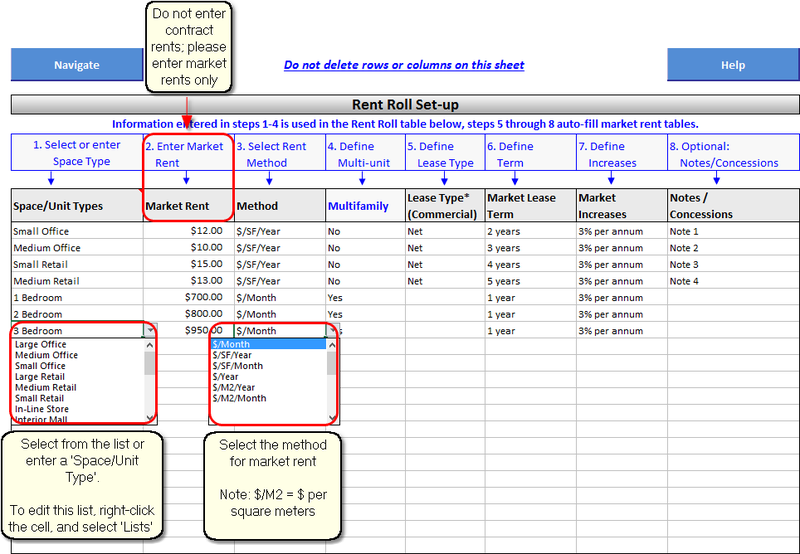 This table organizes market rent parameters by space type. Do not enter contract rents here (see Rent Roll). Commercial. Includes all space types not multi-unit such as retail, office, industrial, etc. Multi-unit. Includes space types such as multifamily, mini-storage, etc. Under these two broad classifications, space types are further defined in Step 1 of the Set-up table. The Set-up table has eight inputs for each space type and can accommodate up to 20 space types. 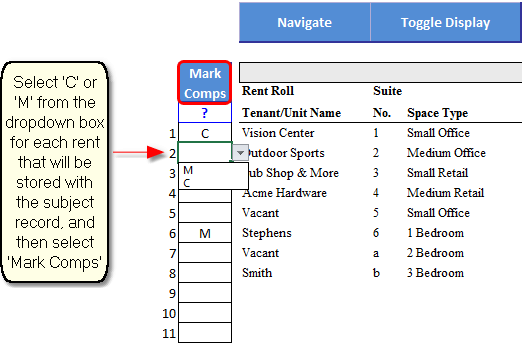 Most of the functions of the rent roll are organized by space types; therefore it is important to properly and consistently organize space types. Step 4 may have two steps if the subject has multi-unit space types. The first step is to define the type of multi-unit (e.g., multifamily or mini-storage). The second step is to select Yes in row below. 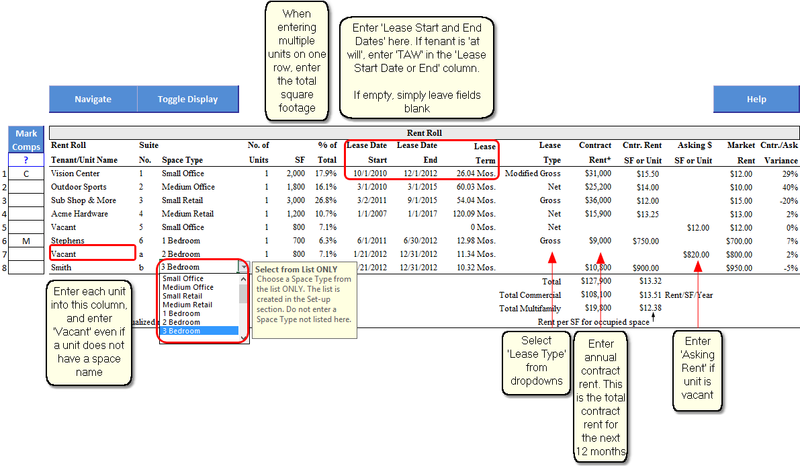 This will break out occupancy, rents and more on a per unit basis in various tables on the Rent Roll worksheet. 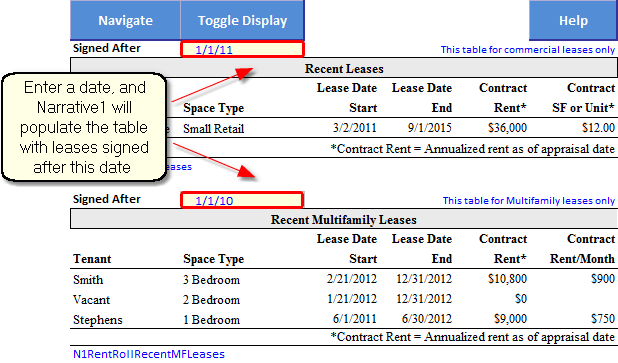 Lease definitions are shown under the Set-up Table (shown above). These are default definitions used by Narrative1, are optional and can be replaced with definitions that are customary for your market. These tables simply summarize the market rent parameters from the Set-up table for presentation in the narrative report. Enter rent by space or unit type. 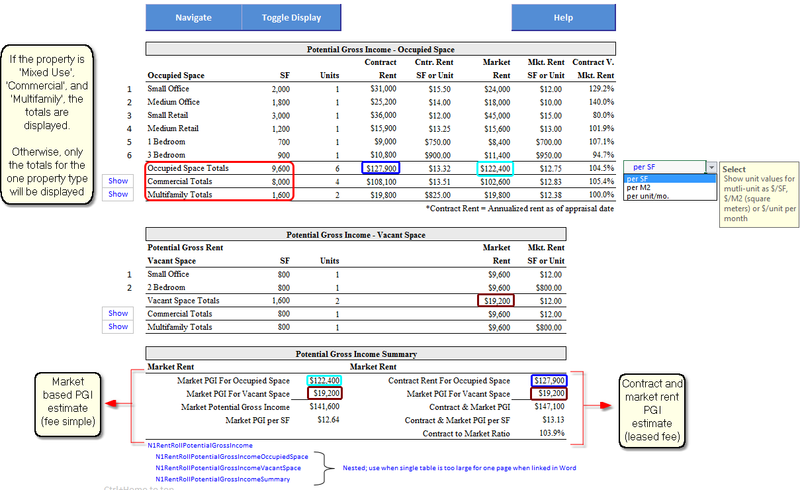 Commercial space types are typically entered on a tenant by tenant basis (one tenant per row); multi-unit can be grouped by unit type. Important: The Space Type must be selected from the list. To edit the list, go to the Set-up table. The table can be expanded using the Show Rows, and can be contracted using the Hide Rows (same button, new label). Rents can be saved as part of the subject record when/if the subject is saved to the database as a comp. Up to 7 commercial rents (Retail, Office, etc,) may be saved with the subject record. Up to 5 Multifamily (or other multi-unit types, such as storage) may be saved in the subject record. To indicate which rent to save, use the Mark Comps column and button. First mark the rent as C (Commercial) or M (Multifamily). These two options are in a drop-down in each cell. Click the Mark Comps to update the subject record. 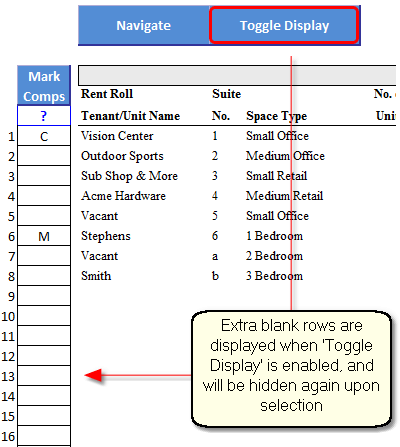 This table is automatically generated from the rent roll and displays various occupancy metrics by space/unit type. 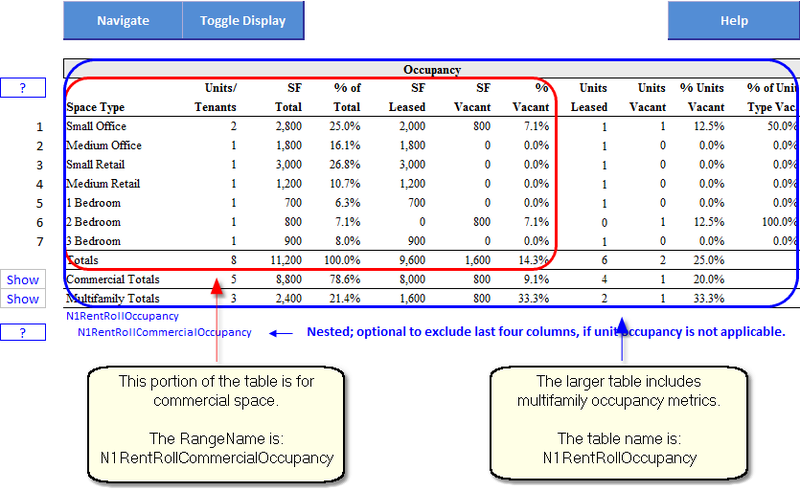 The table has two dimensions; if the there are no multi-unit space types listed in the Set-up table, only the square footage for occupancy metrics are used and merged to the narrative. This table is a "nested" portion of the larger table. If there are multi-unit space types defined in the Set-up table, then the full table is used and merged with the narrative. Narrative1 will automatically adjust the header and total rows in the table. Note: The default Narrative1 Word template for general commercial use (N1Report.doc) merges with only the commercial portion of the table (the table name is "N1RentRollCommercialOccupancy"), while the N1Report Multifamily.doc merges with the whole table ("N1RentRollOccupancy"). Therefore, if the property is mixed-used and the Narrative is based on N1Report.doc, remove the "N1RentRollCommercialOccupancy" table and insert the ("N1RentRollOccupancy"). See Inserting Fields and Tables. There are two tables for recent leases, commercial and mutlifamily. Each table has a date field at the top which delineates the time frame to use when populating the table. 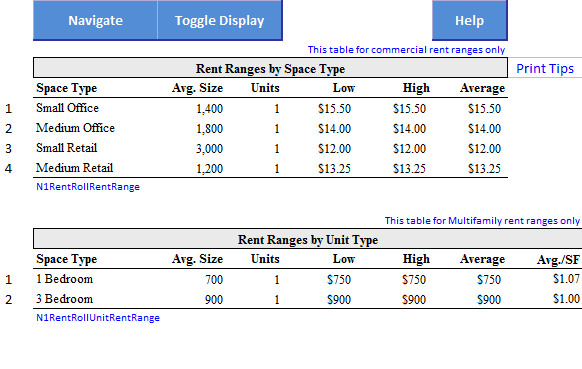 These tables populate automatically and are display the average, low and high contract rents. This table is for commercial space only. Enter a minimum size and the table will populate with the top 10 tenants, sorted from largest to smallest. This table is for commercial space only and shows the amount of square footage due to expire for the next ten years following the selected analysis date. The date field at the top of the table has a drop-down list with dates from the Dates & Premises worksheet (As Is, As Complete and As Stabilized Dates). 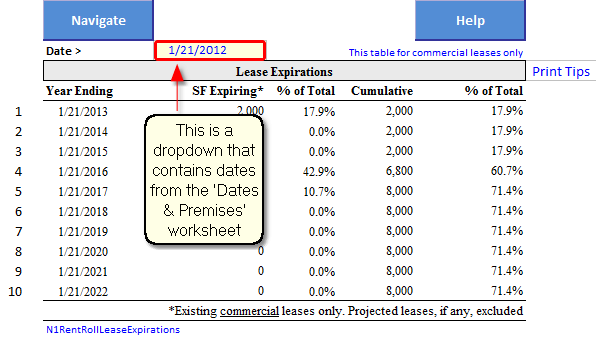 The table will display lease expirations from the selected date forward. PGI summary for market rent and PGI for contract rent and market rent for vacant space, if any. This table provides a basic set of calculations for adjusting "As Stabilized" value estimates to reflect "As Is" value estimates when a property suffers rent loss from a higher than market vacancy and/or below market contract rents. For example, assume most properties of the subject type and market segment have 10% vacancy, but the subject has 25% vacancy. The "As Stabilized" value estimate would assume a 10% vacancy. The "As Is" value estimate would then be adjusted downward from the "As Stabilized" value because of the subject's higher than market vacancy factor. In this case, the downward adjustment would consider the present value of the lost income over the lease-up period, leasing commissions associated with lease-up and perhaps tenant fit-up and additional operating expenses associated with the vacant space over the lease-up period. The Stabilization Calculations table is essentially a short discounted cash flow analysis. The table has a maximum analysis period of five years. Further, some of the rows may be hidden via the show/hide settings used throughout the Narrative1 system. Actual PGI for Vacant Space: This figure is from the Rent Roll table and is the dollar amount of the subject’s current vacancy. Stabilized PGI for Vacant Space: This figure is calculated from the Rent Roll table and is the dollar amount of vacancy at stabilized occupancy, calculated by multiplying the PGI at market rent by the stabilized vacancy and collection loss rate (from the Capitalization worksheet). Adjusted EGI Rent Loss: If future rents are expected to change over time, enter a percentage in this row to increase/decrease the income. % Leased: This is the percentage of space leased for the given year. IMPORTANT: The percentage is applied toward the original vacancy, not the remaining vacancy. The percentages entered in this row should total 100%. $ Leased: Automatically calculated, this is the dollar value of the leased space. Annualized Rent Loss for $ Leased at 50%: (Added 9-7-10) Automatically calculated, This line assumes that absorption will take place over the course of the year and on average, only 50% of the rent will be captured. In effect, the calculation assumes space is occupied at the mid-point of the year. $ Vacant: Also calculated automatically, this is the dollar value of remaining rent loss and is carried forward to the next year. Leasing Commissions: The leasing commissions are calculated based on the inputs at the bottom of the table. There are two inputs: the rate and the number of years to apply the commission. These factors are applied to the dollar value of the leased space for the year (the "$ Leased" row). Note the total amount is applied in year the space is leased. Tenant Improvements: Hand enter. When entering TIs for future years, adjust for inflation. Other: Hand enter. Additional stabilization expenses that might be considered are operating expenses associated with the vacant space over the lease-up period, additional marketing expenses, etc. Discount Rate: The discount rate is used to convert the anticipated future cash flows to a present value. It reflects the risks and timing of the cash flows and can consist of equity or a blend of equity and debt position requirements. It is a yield rate as opposed to a capitalization rate, and reflects a return on the amount invested. For example, if a property is purchased with cash (no debt), the discount rate is synonymous with the investor's desired yield, or internal rate of return (IRR). Present Value/Rounded: These are the final amounts of the stabilization/lease-up adjustment which deducted from the "As Stabilized" value estimate(s). It is the difference between the "As Stabilized" and "As Is" value estimates. The Stabilization Calculations table in Narrative1 is one of many ways to calculate a stabilization/rent loss adjustment. It utilizes a generalized approach, working with percentages of rent loss rather than square footage, units or lease-by-lease calculations (though percentages could be tweaked to emulate the absorption of specific spaces). It is intended to address simple rent-loss scenarios; complex rent loss/lease-up conditions may be better analyzed with a discounted cash flow analysis.